Should you choose the Toyota Tundra as the truck you want to drive? If you’re looking for a truck that has the reliability of the Toyota brand and strong resale value while offering the power and the active features you want, the Tundra is the right choice. The 2019 Toyota Tundra is a truck that’s spacious, powerful, and ready to offer you the right way to get things done. There are several different ways you can have the Tundra with trims and packages that make this truck one that will provide you with many years of great driving. Take a drive on the road in the Toyota Tundra and see what this amazing truck can give you. You’ll have a large bed that you can fill with materials that you take with you on the road, allow the entire crew to join you so that you can get more work done, and tow a heavy load behind this truck. Everything you’re looking for in a capable and impressive truck can be found in the Tundra that will be ideal for you to get things done. The 2019 Toyota Tundra TRD Pro model is upgraded for this new model year. This truck has new Fox shock absorbers and BBS alloy wheels to bring you more of the items you’re looking for. Otherwise, the Tundra for the 2019 model year is the same as the 2018 model that you saw in the past. You’ll have a smoother drive and feel the difference when you take the TRD Pro model of the Tundra out on the trails to show off the capabilities of this truck. The Tundra is offered with the Toyota Safety Sense-P (TSS-P) active safety items which include a pre-collision system, automatic high beams, radar-based adaptive cruise control, and lane departure alerts. Other items you’ll find include a lockable tailgate, a 6.1-inch touchscreen, power windows and locks, heated side mirrors, 18-inch steel wheels, a rearview camera, a six-speaker audio system, Bluetooth connectivity, a USB port, an auxiliary input, and adjustable front seats. This is an excellent place to start the shopping you’re looking for in a great truck. The SR5 model of the Tundra gives you a seven-inch touchscreen, HD and satellite radio, a sliding rear window, storage beneath the rear seats, and more. Move to the Limited trim and you’ll enjoy an upgraded audio system, a navigation system, 20-inch alloy wheels, leather upholstery, heated and power-adjustable front seats, and chrome mirror caps. The TRD Pro has specialized equipment to give you the off-road experience you want and the Platinum and 1794 Edition models have heated and ventilated front seats, a moonroof, blind spot monitoring, and a JBL premium audio system. There are two engines offered for the Tundra which both make use of a six-speed automatic transmission for the drive. This truck can be powered by a 4.6-liter V8 engine that makes 310 horsepower and 327 lb.-ft. of torque or by a 5.7-liter V8 that offers you 381 horsepower and 401 lb.-ft. of torque. Both powertrains can be set up in either 2WD or 4WD and you can enjoy the fuel mileage you’ll want when you take this truck for a drive. The power of the Tundra is ready to give you an excellent way to get things done. 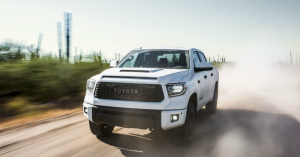 If you’re looking for a great truck to drive and you want to enjoy one that has the reliability that comes with the Toyota brand, the 2019 Tundra is the right choice for you. Check out this big and powerful truck that has the roominess and the capabilities you’re looking for at a Toyota dealer near you. This is a truck that can easily offer you the drive you want and the ability to get a lot of work done when you take it out to the job sites in your area.